Ten years after the corps' first Drum Corps International World Championship title in 1976, Blue Devils brought back its popular "Channel One Suite" in 1986 and swept all of the caption awards, just as the corps did when the piece was played a decade earlier. 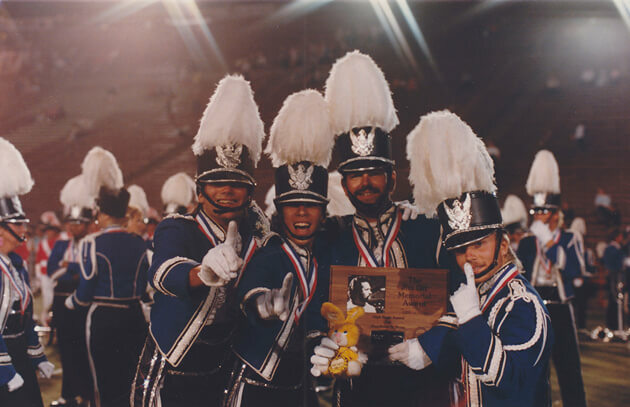 Among the caption honors the Devils received was for brass performance, for which the corps took home the Jim Ott Memorial Award (pictured), named in honor of the former instructor and arranger of the Stockton Commodores, Blue Devils and Spirit of Atlanta who tragically died in a car accident in 1980. After winning five DCI World Championship titles from 1976 to 1982, 1986 marked the Blue Devils' first in four years. After a narrow defeat to Santa Clara Vanguard at the season-opening contest in Sunnyvale, Calif., the corps never looked back, taking first place at every one of its events through the World Championship Finals on Aug. 16 at Camp Randall Stadium in Madison, Wis.